Holy One of brilliant light and deepest, warmest darkness—both of which hold and guide, teach and heal us. We are gathered in your presence amidst the impossibilities of another spring. Touch my mouth and all of our hearts, that we, with our kindred, Peter and James and John, might encounter you. Amen. I can still remember all the details—a hotel ballroom in downtown Atlanta. The summer of 2004. Walking around town, the backs of my hands were sweating—something I’d never experienced before. It was my first time with The Fellowship of Affirming Ministries—the Pentecostal, African American, LGBTQ movement and I was transfixed. In particular, I can still close my eyes and see the moment when a young man with full-blown AIDS walked into the ballroom and Bishop Flunder stopped everything else we were doing. She had been told that he was very, very sick and had boarded a bus in St. Louis the day before and taken it overnight to be with us because he was gay, had been rejected by his family and he knew he needed a healing. When he was invited into the middle of the gathered church and we were invited to lay on hands and pray, I felt a power of the Holy Spirit like I’ve never felt in my entire life. Amidst tears and shouts, we prayed him back into love and community. I don’t know if we invited any kind of a cure. But we, together, healed him. I can still remember all the details—inside the sanctuary of Christ Lutheran Church on Capitol Hill. It was a Wednesday night in early May of 2013. It was raining outside, but not too hard. It was warm inside as over 800 people packed in for the joyous, multifaith service the night before the Minnesota House was to vote on the Marriage Equality legislation that was before them. Rabbi Latz and members of Shir Tikvah held a chuppah and talked about the sacred blessings he had bestowed upon so many couples underneath its cloth. Pagan leader, Robin Mavis cast a circle which sought to protect us all from that which wished harm and welcomed all in who sought to celebrate love. And the entire congregation sang, from floor to rafters, “And God will rejoice when we are creators of justice and joy, compassion and peace. Yes, God will rejoice when we are creators of justice…. justice and joy.” And then all 800 of us walked in the rain across the street to leave paper hearts with our messages of love on the steps to the Rotunda so that legislators who would vote the next day might enter the Capitol along a path of open hearts. (I have thought a lot about justice and joy these past few weeks, as that hymn, For Everyone Born, is an anthem for United Methodists who welcome and affirm LGBTQ folx). I imagine that Peter and James and John could remember every detail of that time on the mountaintop, too. I imagine that the experience of a kind of power and connection they had never known before was something that lived on in their cells as a palpable memory. The dazzling light that I imagine they could close their eyes and see for years to come. The sight of Moses and Elijah and the foretelling of all that had come to pass. Indigenous and African American activists talk about First, Second and Third Space. First space is the conditions of oppression and violence that mark much of daily life. Second space is the resistance, the knowing that something isn’t right, the refusal to settle for First Space. And Third Space are those experiences and times when, if only for a moment, or a day, or a collection of days, an experience of liberation, of healing, of wholeness free of oppression happens. It is those moments of Third Space that fortify and encourage our living in Second Space in order to resist First Space. The story of the Transfiguration is a story of Third Space. It is a story of Peter and James and John being gifted by Jesus with a vision of the future that will be but also already is. And it is not coincidence that Jesus allows them this experience of Third Space as a way to fortify them for the journey they must accompany him on through his arrest, trial and execution. He knows they need it to have any chance at holding on to hope amidst their despair. This question of how we hold on to hope in a world that provides us with so much evidence for despair is one that has gripped and guided me most of my life. It is especially close to my heart each year during the Lenten journey. And it is especially close to my heart this Lent. We have chosen Healing Justice as our theme for our Lenten journey this year. And Healing Justice cares very deeply about hope and despair. We will be spending time in Adult Ed, during our spiritual practices during the week and in our Sunday services exploring more deeply what we mean by Healing Justice. But the notion of Healing Justice comes out of the reality that justice work and healing work must be deeply woven together. I was first taught about Healing Justice by Susan Raffo and Cara Page—two queer women who are long-time activists and body workers and who study generational trauma. They are rooted in lineages of healers who have noticed how so much of our justice work in the United States is disembodied and demands a pace and level of intensity that actually does violence to many bodies. People literally can’t keep up with everything they’re supposed to do. They can’t sleep or rest or celebrate or laugh because the work demands action, doing, progress, solutions, results—without any understanding of the irony that how we do our justice work is actually shoring up the systems we say we want to dismantle and transform. So the critique that Healing Justice brings is that too much of our justice work and our self-care industry aren’t actually about justice or healing. 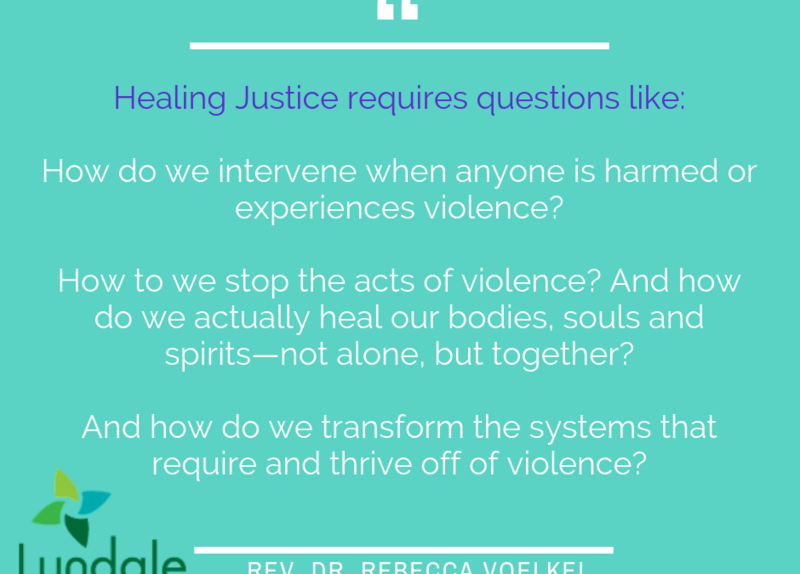 And so the dream of Healing Justice is to ask questions like: How do we intervene when anyone is harmed or experiences violence? How to we stop the acts of violence? And how do we actually heal our bodies, souls and spirits—not alone, but together? And how do we transform the systems that require and thrive off of violence? As you can see, Healing Justice invites us to consider that there is no healing without justice and there is no justice without healing. In my life, this understanding is the kind of truth Jesus invites us to. It is gospel wisdom. And like most gospel wisdom it is simultaneously easy to preach and difficult to embody and live. So how do we even attempt to embody and live them? I think our Scripture reading for this morning helps. It suggests that one way to embody Healing Justice is to make sure we find Third Space as often as possible. We are living amidst a lot of things that could cause us to despair—both personally and collectively. There is so much violence, so much pain. So much First Space. From Christchurch to the nephew grappling with cancer and the every day cruelty our beloveds endure. But thankfully, there is also abundant evidence of Second Space. The resisters and the interrupters of violence. Just this week, this congregation embodied the friend who was present at the bedside of a friend experiencing surgery, the small group planning the every day resistance to the horrors of the detention centers at the border, the artist who is painting, stroke by stroke, the faces of this community so as to remind us of our connections. In order to continue to practice this healing and resistance, this Healing Justice, we must seek out Third Space. Throughout my life—in Lent and at other times (hot, humid summers in which church conferences are held and rainy Springs during Legislative Session)—one of the ways I find Third Space is by worshiping with kindred souls seeking hope. Collective praying, communal singing, shared eucharist, public acts of healing and love. Sometimes they are experiences whose every detail I remember that literally transport me toward that promised future that is already here. But sometimes they strike me as regular or even mundane or boring. But the practice of setting aside time and gathering together so that small and large Transfigurations might happen is one invitation this Lent. On March 5th, I turned 50. As a way to celebrate this milestone birthday, I gathered with a bunch of friends to watch a documentary on Holly Near—someone whose music has shaped me in powerful ways. If you don’t know her, she composed “We Are A Gentle, Angry People” on the way to the candlelight march the night Harvey Milk was assassinated and it was the song we used here during the vigil for the Pulse Nightclub victims. The film ended with her singing another of her signature songs.